There is a wealth of phenotypic information in the evolutionary literature that comes in the the form of semi-structured character state descriptions. To get that information into computable form is, right now, an awfully slow process. 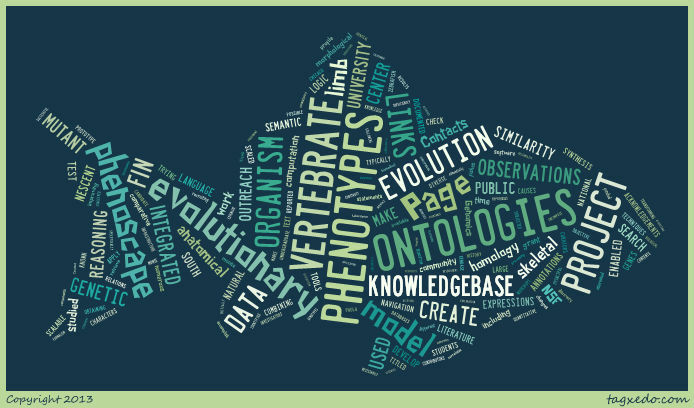 In Phenoscape I, we estimated that it took about five person-years in total to curate semantic phenotype an notations from 47 papers. If we are to get computable evolutionary phenotypes from a larger slice of the literature, we really need to figure out ways to speed this up. One promising approach is to use text-mining. This could contribute in a few different ways. First, one could efficiently identify all the terms in the text that are not currently represented in ontologies and add them en masse, so that data curation does not have to stop and resume whenever such terms are encountered. Second, one could present a human curator with suggestions for what terms to use and what relations those terms have to one another, speeding the process of composing an annotation. CharaParser, developed by Hong Cui at the University of Arizona, is an expert-based system that decomposes character descriptions into recognizable grammatical components, and it is now being used in several different biodiversity informatics projects. Baseline evaluation results from BioCreative III showed that a naive workflow combining CharaParser and Phenex, the software curators use to compose ontological annotations and relate them to character states, was capable of identifying candidate entity and quality phrases (it outperformed biocurators by 20% in recall on average) but had difficulty translating those into ontological annotations. This first iteration workflow also was not yet reducing curation time. In March, a small contingent from NESCent (Jim Balhoff, Hilmar Lapp and Todd Vision) visited Hong Cui’s group in Tucson. We talked through improvements to CharaParser and the curation workflow, brainstormed plans for a more thorough set of evaluation tests, began refactoring of the code so that it can be more easily shared across projects, and gained a better understanding of what features make a character difficult to curate for humans vs. text-mining. We made substantial progress on all fronts, and are looking forward to seeing how much improvement in the accuracy and efficiency of curation will be achieved in the next round of testing. We are also pleased to report that the CharaParser codebase will now be available from GitHub under an open source (MIT) license. This entry was posted on Saturday, March 30th, 2013 at 1:56 pm and is filed under Data Curation, NLP, Ontology, Phenex, Software. You can follow any responses to this entry through the RSS 2.0 feed. You can leave a response, or trackback from your own site.